Every so often, one stumbles across a play that makes you wonder if you’re not just eavesdropping on other people’s lives rather than watching a theatrical production. Lilies and Sweets by first-time playwright, Nathan Wright is one such play. 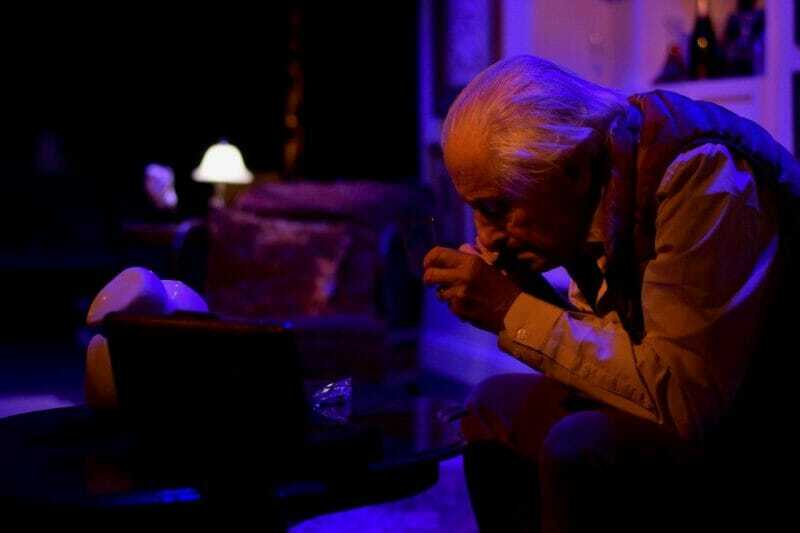 The intimate setting of the The Pleasance Downstairs certainly plays its part in transporting the audience to Les’ (James Woolley) tastefully furnished Hampstead flat which provides a constant backdrop to the highs and lows throughout. Set designer Emily Megson has to be credited for the attention to detail which brings the home of the ageing gay metropolitan novelist to life, complete with crammed bookshelves, champagne cocktails in goblets, Joni Mitchell CDs and an elegant but ambiguously shaped white china ornament on the antique coffee table. Intelligent and unobtrusive direction by Spencer Noll and Hugh Wyld is also in evidence as the tale of the unlikely bond between Les and young Dudley-born Al (played by Nathan Wright himself), Terry (David Whitworth) and Ian (James Wallwork) unfolds in a natural fashion which only occasionally seems surreal as real life often is. Strong performances by all four cast members make the characters in Lilies and Sweets believable and engaging. It is hard to believe that Wright, in particular, is acting and in a way he actually isn’t, as the story is based on his own real life experience. This may partly explain why his sparkling script demonstrates an affinity with dialogue rarely seen in new playwrights. From the outset, we learn so much about the characters not just by what they say but how they say it. Laughs come thick and fast from linguistic misunderstandings, based on a range of social factors which have the capacity to divide. Les and Terry’s interaction with the Grindr app is a priceless moment, as is Al preparing wraps of cocaine on Les’ immaculate carpet! As we learn more about the characters, however, and that they are all scarred in different ways by their backgrounds, superficial differences based on region, generation, class or sexuality pale into insignificance. As with life, comedy and tragedy often go hand in hand and the light touch with which an unexpectedly poignant development in Act 2 is handled just manages to strike the right balance between realism and sentimentality. The way that Wright has given a structure with a beginning, a middle an end to a story based on the habitual untidiness of real life is further evidence of his aptitude as a writer. The end is a truly heart-warming and uplifting endorsement of the power of love and friendship. 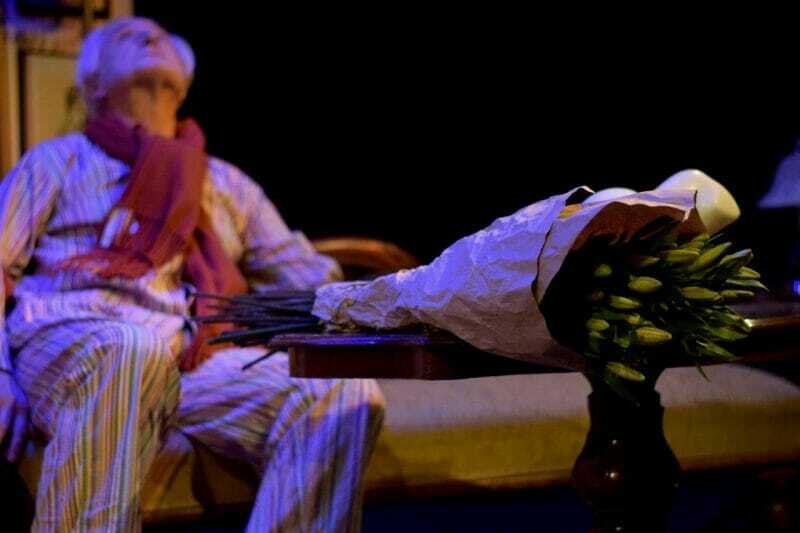 Lilies and Sweets is more than a celebration of the changing perception of gay people in society over recent years. It has much to say to and about us all and how we relate to those we initially perceive as different to ourselves. It says it with humour and it says it with pathos, much like in life itself. Lilies and Sweets is at The Pleasance Downstairs until 16th February 2019.